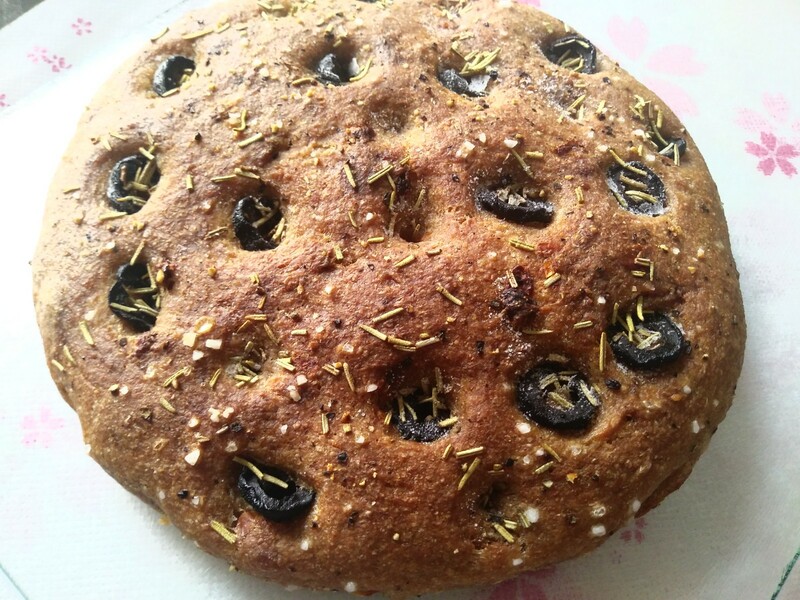 Focaccia is one of my favorite bread. It’s not hard for someone to understand why after learning about my love for salt. Mix together the hot water and barley flour. Set aside until needed. Sift out the coarse bran from the dough flour, reserve 21g for leaven. Soak the rest, if any, in equal amount of water taken from dough ingredients. Combine all leaven ingredients and let sit until doubled, around 3 hours. Pour cold water into the spelt flour slowly until a rough dough is formed. Autolyse for 2 hours. Knead in the rest of the ingredients and the scalded barley dough and ferment for 30 minutes. Fold in the add-ins then ferment for 3 hours longer. Preshape the dough then let it rest for 15 minutes. Lightly oil a sheet of parchment paper that fits an 8 inches cast iron pan. Place the dough into the pan then stretch it gently into a circle. Proof it at room temperature for 1.25 hours. Preheat the oven at 250°C/482°F. Poke holes into the proofed dough and place the olives into the indention. Drizzle olive oil then sprinkle rosemary over them. Top the dough with coarse salt and black pepper. Spritz the dough then bake at 250°C/482°F with steam for 15 minutes then without steam for 15 minutes more or until the internal temperature reaches a minimum of 208°F. Let cool for at least 1 hour before slicing. It developed a shiny and crispy crust in the oven. The coarse salt and black pepper added not only flavour but also texture and look. 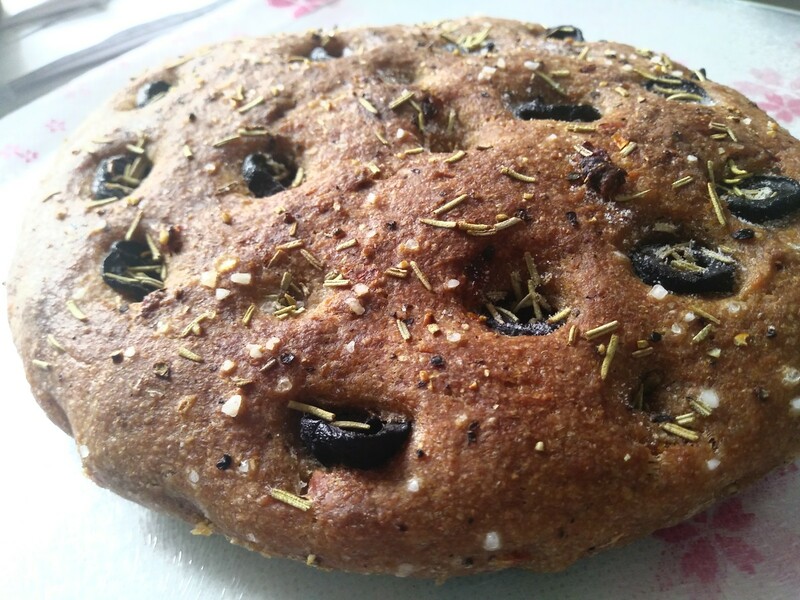 Infused with the flavour of rosemary and sun-dried tomatoes, the bread is very aromatic. The kitchen smelled wonderful when it was baking. 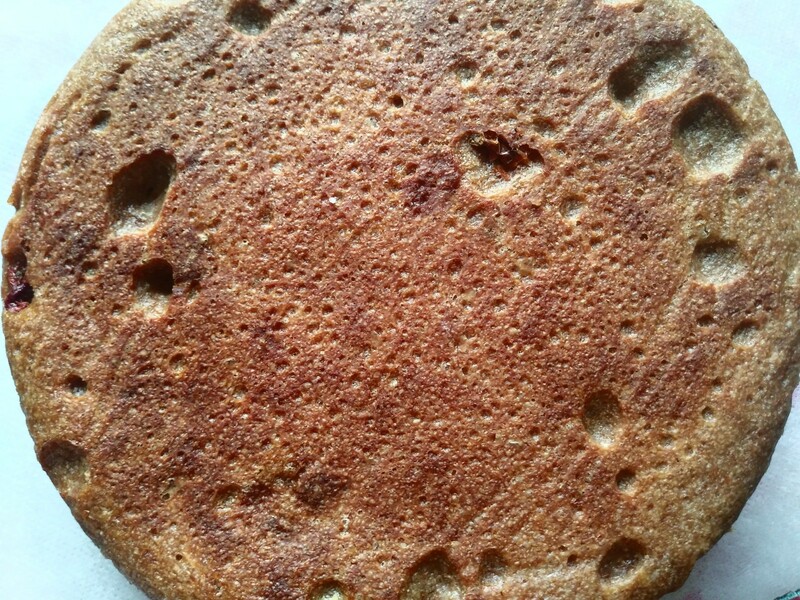 The crumb is moderately open and chewy. I like the balance of sweetness, sourness, saltiness and spiciness in this bread. After months of waiting, the grains I ordered overseas arrived! Immediately I put kamut, the grain I have wanted to try for ages, into use. Sift out the coarse bran from the dough flour, reserve 35g for leaven. Soak the rest (I got 9g), if any, in equal amount of water taken from dough ingredients. Pour cold water into the un-sprouted kamut flour slowly until a rough dough is formed. Autolyse for 2 hours. Knead in the rest of the ingredients ferment for 30 minutes. Stretch and fold the dough before fermenting for 2.5 hours longer (mine was over-fermented at 2.75 hours). Preshape the dough then let it rest for 15 minutes. Shape the dough and put in into a banneton. Retard for 10 hours. Preheat the oven at 250°C/482°F. Remove the dough from the fridge to warm up at room temperature for 20 minutes. Score and spritz the dough then bake at 250°C/482°F with steam for 15 minutes then without steam for 25 minutes more or until the internal temperature reaches a minimum of 208°F. Let cool for at least 2 hours before slicing. Since I returned home late, the dough was over-fermented and over-proofed. It spread in the oven and there was no oven spring. Also, the excessive proteolysis contributed to this cracked crust. 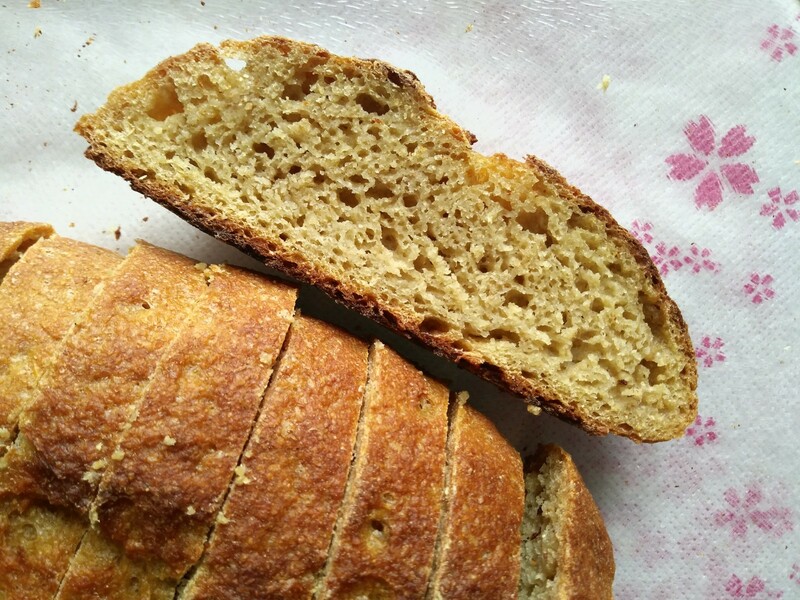 Though the crumb openness is not pleasing, the flavour is outstanding. This bread is for those who don’t like sourness in bread. It is pleasantly sweet with tanginess so subtle that I couldn’t really tell it is there. The other thing I like is its colour: the yellowish crumb lifted my mood instantly! 100% kamut is not as tricky as you might have thought! The dough resembles 100% whole spelt in some ways but I think it is even easier to handle than spelt. It is thirstier and much stiffer at 90% hydration so the hydration can probably go higher. Both 100% whole spelt and kamut are so delicious they're worth a shot! You're talented so I'm sure you're ready for the challenge. Glad you like the food, Kat! I too have not been brave enough to try 100% Kamut. I love the colour of it though. Yours looks gorgeous and I love the focaccia. Wish you were closer because I would definitely invite myself over to sample all your goodies! Well done! We share the same wish! Kamut is surprisingly easy to work with. It had no spreading issue at all, well, until it got into the oven over-proofed... Give it a chance! Just the colour alone is worth the effort. Thanks for the compliment and happy baking! Everything is outstanding ! I love Kamut and use it all the time but never 100 %. I make lemon curd and would love to know how you incorporated it into the bread. As part of the dough or as a filling ? How did you make the curry ? I see brussel sprouts I think and ??? We love curry ! Those reddish brown jewels were skin-on peanuts. They were pan roasted in a tsp of homemade ghee until fragrant and crunchy. I removed them from the pan then added 1/2 tsp of whole cumin seeds, 1/4 stick cinnamon and 2 cloves of minced garlic into the same oil. After that 1 tbsp of desiccated coconut went into the pan. When it was toasted, I put in the pressure cooked chana dal (50g dry weight) along with half a cup of water. I mashed the dal gently until the desire consistency was reached. For a golden colour, 1/8 tsp of turmeric was sprinkled in. Season with salt (1/4 tsp for me) and black pepper. I then tossed in the cooked penne (around100 g dry weight for the amount of sauce) with a tbsp of pasta water and it was done! 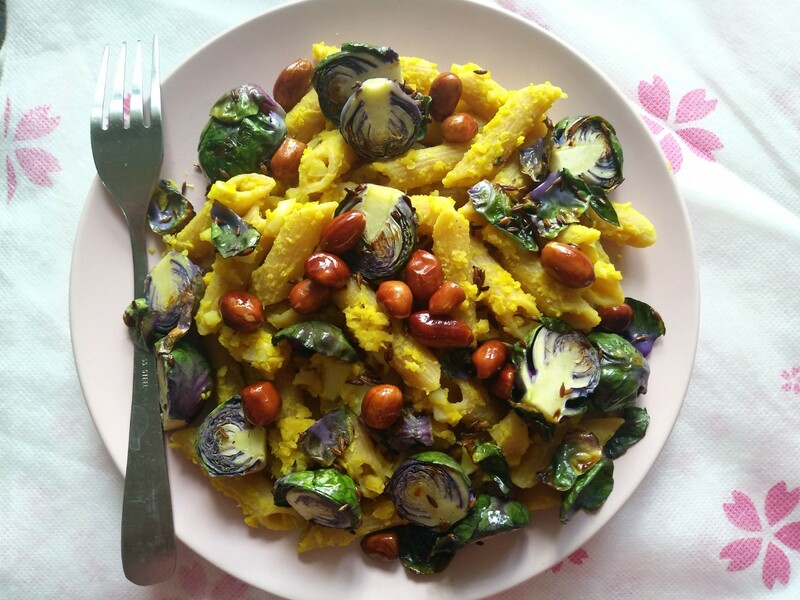 Top with the roasted peanuts, caramelized brussel sprouts and raisins if desired. Keeping things interesting is key to maintaining enjoyable cooking and baking time for me. Happy curry cooking! 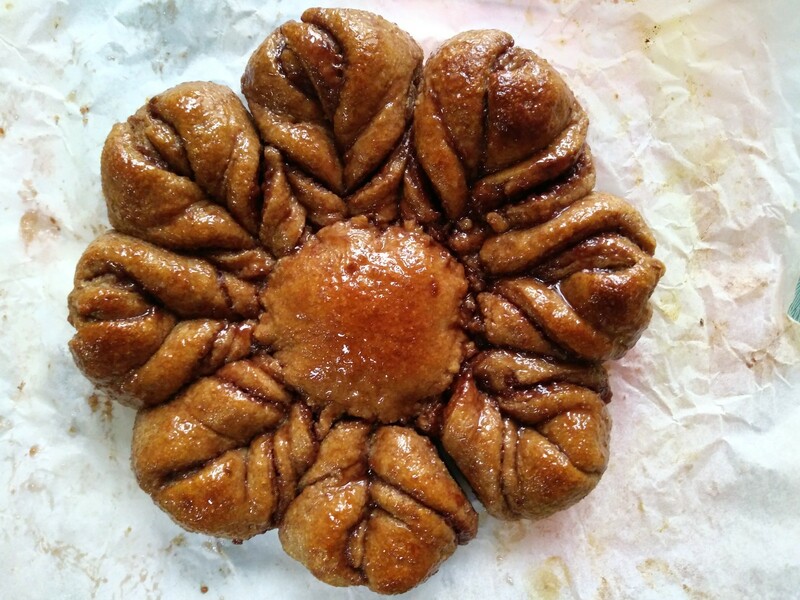 I love the architectural rosette tang zhong bread the best:-) it takes me back to classicla Greek and Roman architecture! Loved the post and happy baking Elsie! Kamut has a clean sweet flavour while spelt is sweet in a malty way to me. I love both of them but spelt is truly much more affordable in comparison... But still I think the 5 lbs I ordered might not be able to last me a year. Perhaps because I added 1 tbsp of vital wheat gluten, unlike spelt and einkorn, the dough was pretty stiff and strong throughout the bulk and proof. No spreading was experienced and I thought it would still do fine with 3% more water. I guessed the spreading was caused merely by over-fermentation and over-proofing since it only spread after entering the oven. Was I wrong to assume that? Glad you loved the post. Happy baking to you too! inside and out! I don't know all of the other grains' tastes but the toppings make me want to devour it. As you can probably tell, I prefer chewy bread to airy bread. Glutinous rice produces a spongy and "mochi" textured crumb that I truly love. The only drawback for including it is that the dough becomes much stickier and harder to handle. 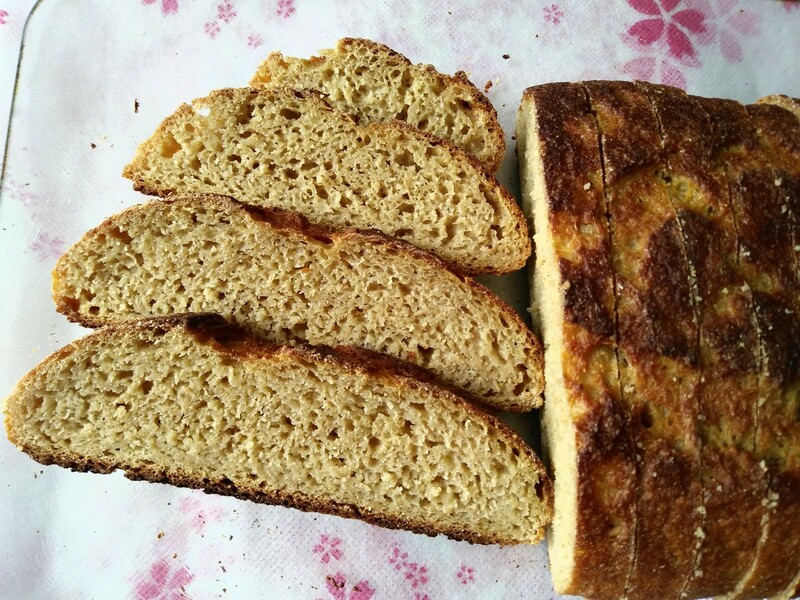 The method I adopted for this bake was different from the one in my kaya bread post. I cooked the 30% of purple rice in all the liquid for the dough, which made true mochi. 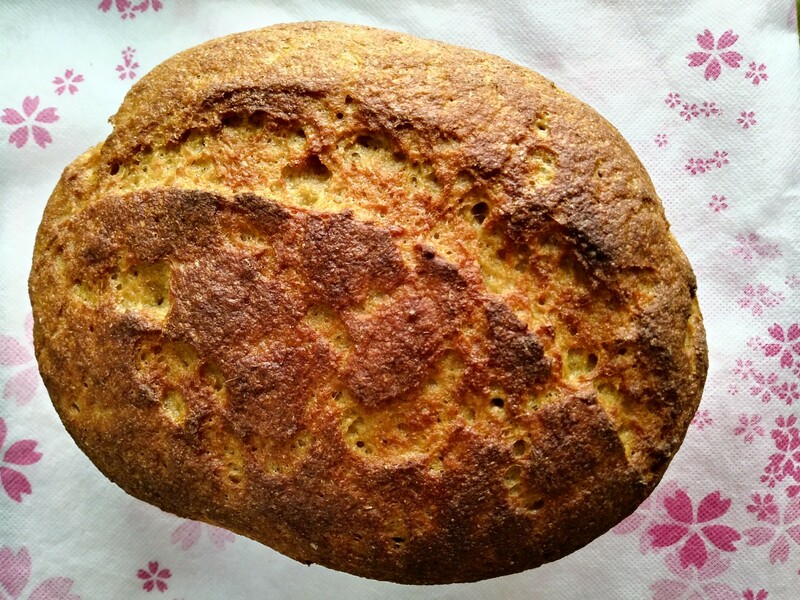 The texture of this bread is springier and resembles more of sticky rice cake yet it was a nightmare to knead... The dough stuck to my hands every time I touched it! One benefit of using purple rice instead of regular white sticky rice is that another layer of texture is gained. 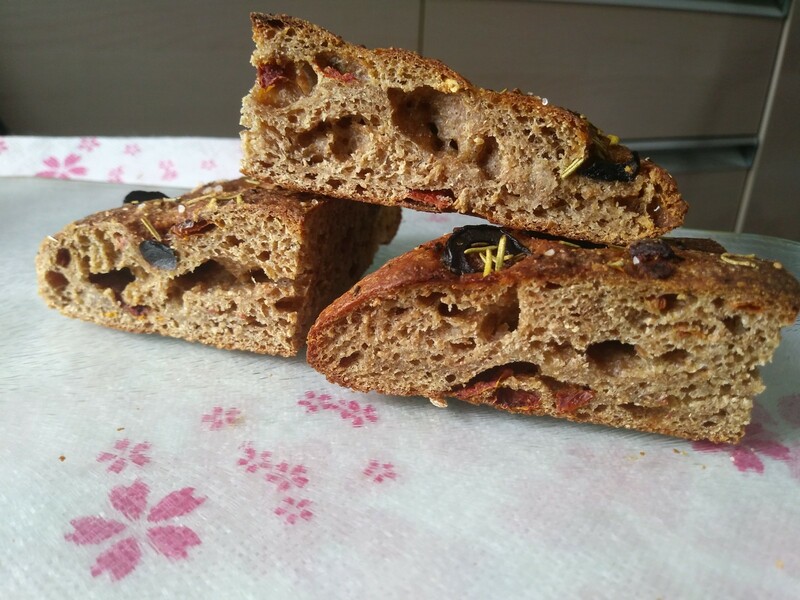 The bran of purple rice becomes crunchy bits in the resulting bread, contrasting the slight chewiness and softness. 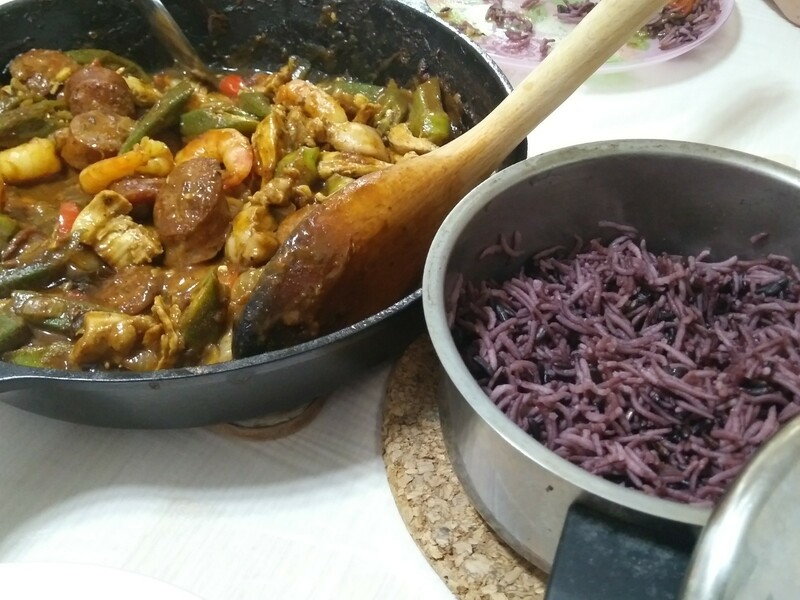 Also, purple rice is so much more fragrant than white sticky rice! I love olives and sun dried tomato together, yum! Olives and sun-dried tomatoes belong with each others! Kamut is very sweet so it's perfect when you're baking for someone who doesn't like sourdough bread. I'm sure it'll turn out better next time! Love that focacia. It's been too long since I made one myself, so I think it's time again. Too bad you overproofed your Kamut bread. I am a big fan of this grain and have made many bakes with it. Not sure I have done 100% Kamut though. I'm sure your next attempt will be just right, but it looks like yours is still tasty anyway. 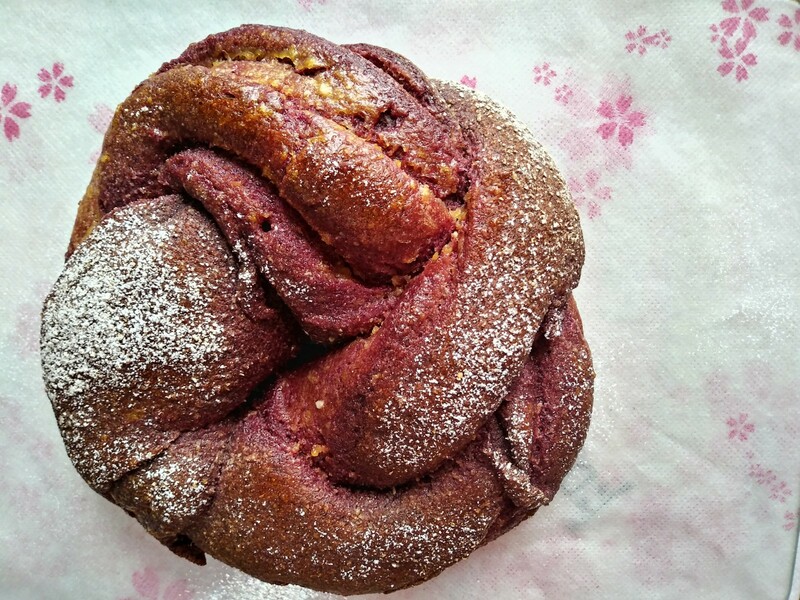 The cinnamon raspberry tang zhong bread looks fabulous as does the lemon curd swirl bread. You can hardly mess up focaccia and it is the kind of popular bread people bring to parties, knowing that it'd be devolved in no time! Glad you like the bread. Happy baking! It did taste good. Purple rice and lemon made a nice match surprisingly. What made it stand out was the mochi-like texture though. It suited the taste bud of someone who prefer chewy to airy bread like me.